iConverter T1/E1 MUX products multiplex up to sixteen independent T1/E1 circuits and Ethernet from copper links onto a fibre link or Ethernet Virtual Connection (EVC). Designed for mobile backhaul, and T1/E1 demarcation extension up to 120km, iConverter T1/E1 multiplexers are available in modular or fixed chassis configurations with 4, 8, 12 or 16 T1/E1 ports. The fixed configuration iConverter T1/E1 multiplexers are available in managed and unmanaged models, and operate as bookend devices with one MUX at each end of a dark fibre or CWDM fibre link. The iConverter Modular T1/E1 Multiplexer transports up to sixteen T1/E1 circuits and 10/100/1000 Ethernet over point-to-point fibre, CWDM channel or Ethernet Virtual Connection (EVC). This flexible and scalable system is comprised of an iConverter Fibre Transport module, and one or more iConverter 4xT1/E1 MUX modules installed in a 2, 5 or 19-module chassis. 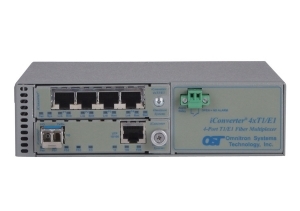 The iConverter T1/E1 MUX/M multiplexes up to sixteen T1 or E1 circuits and one 10/100/1000 Ethernet service onto a fibre optic transport link, and features remote management testing and configuration capabilities. The iConverter T1/E1 MUX/M operates in a back-to-back configuration, and can be used in applications such as multiple T1/E1 extension, mobile backhaul and building-to-building PBX connectivity. The iConverter 4xT1/E1 MUX/M operates in a back-to-back configuration, with one multiplexer at each end of the fibre transport link. The 4xT1/E1 MUX/M can be used in applications where services from legacy TDM equipment require transport across long distances that exceed the reach or capacity of copper. This includes applications such as T1/E1 extension, mobile backhaul and building-to-building PBX connectivity, making it ideal for Enterprise, Telecom and Utility industries. 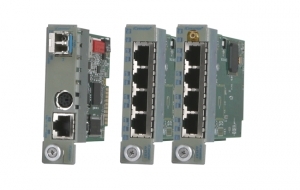 The iConverter 4xT1/E1 MUXes operate in a back-to-back configuration, with one multiplexer at each end of the fibre link. The 4xT1/E1 MUX transports services from legacy TDM equipment across long distances that exceed the reach or capacity of copper. This includes applications such as T1/E1 extension, mobile backhaul and building-to-building PBX connectivity, making it ideal for Enterprise, Telecom and Utility industries.